2013 Siesta Scripture Memory Team: Verse 23! My Border Collie, Queen Esther, is just about as handy as a GPS if she’s been to the destination at least once. The closer we get to where we’re going, the more hyper she becomes. The backseat of my car may as well be a treadmill. In fact, if I’m on the phone, I usually have to hang up because the person on the other line becomes too distracted to talk. My dog. Sorry. She’s a little over excited. She jumps from window to window and commences – not to bark exactly – but to yelp. I constantly insist to Keith that I have the gift of interpretation for the tongue Queen Esther speaks and, when we’re coming up on our destination, I am absolutely sure of what she’s saying: Let me out of this car so I can run the rest of the way! Right about now, you’re the Queen – the real kind and not the canine variety – and it’s the perfect time to start your happiest yelping. You can see from the view out of your window that we are almost to our destination and, after a whole lot of hard work, I hope everything in you is hyping up and hollering, Let me out so I can run the rest of the way! Good grief, you’ve been fantastic. I cannot recall ever having a higher percentage finish out the year. I’d have to check past years to confirm that but I don’t remember ever having a more active group from start to finish. I wish you were sitting right here with me in my chilly den in front of this fire and we could talk face to face instead of line to line. 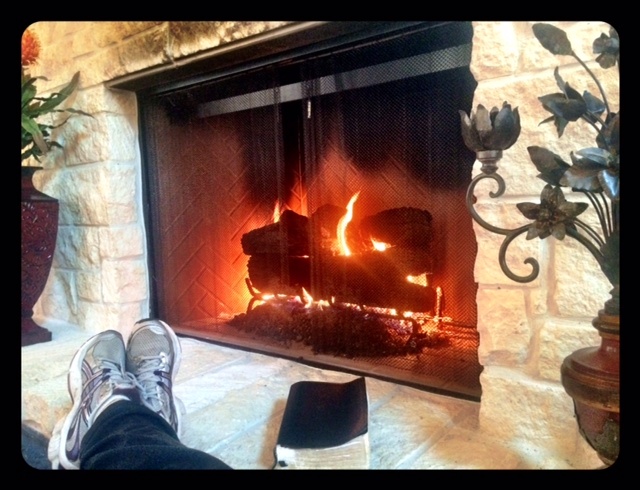 Our heater is out and it is just about as cold in Houston as it gets most winters. We’ve already had the repairman out for hours but he’s been unable to fix it and advised us to call our builder. He thinks it’s a malfunction in the unit. You have to write an email request to the builder for a repair and we haven’t heard back from them yet so it could be a frosty few days. I just worked out on my elliptical with a jacket on if that tells you anything. I don’t mind so much though, as long as it’s fixed pretty soon. It’s gorgeous outside and I love sitting by a fire anyway. The part I don’t like is that Jackson and Annabeth’s room at my house is like ice and they really can’t even play in it right now when they come over. No worries, though. I expect it to be repaired surely by the first few days of this week. If you were here, I’d also serve you up some cinnamon rolls in about an hour. 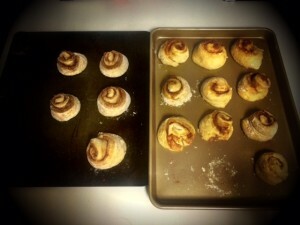 I made homemade rolls for our Thanksgiving feast and I almost always roll out cinnamon rolls with the leftover dough several days later. They’re rising right now under some lights in the only warm end of my house. Some of you are observant enough to ask me if I pulled two of them off the one pan and ate them raw because of those 2 circles of flour. No, I didn’t – though I was tempted – but I did peel them off and put them on the second cookie sheet because the 3 rolls that wouldn’t fit on the first pan looked so lonely over there. My cold house is going to smell like heaven in a little while. 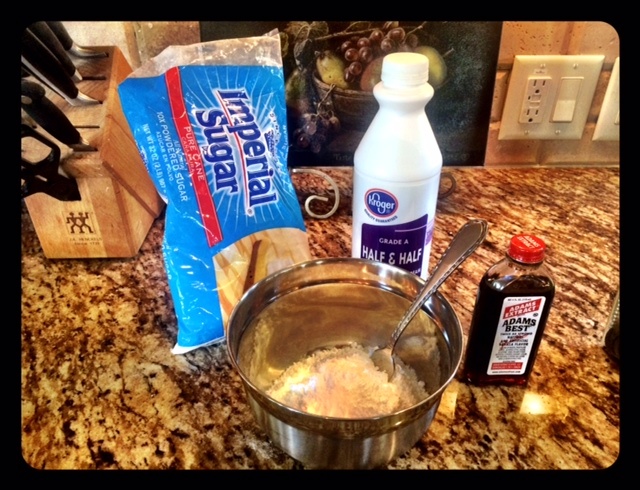 Sometimes I make a thick butter icing but, really, I prefer a thinner glaze made of powdered sugar, vanilla and a tiny bit of half and half. Too much icing takes away from the homemade flavor of the rolls in my opinion. Lord have mercy, no. But, Girlfriend, it’s a holiday. I could make you hot tea or coffee to go with yours, depending upon your preference, and we’d chat a while and then we’d trade our 23rd verses. The second half of it drew me into intercession. It does not say that the reason the Son of God appeared was to deny the works of the devil. It does not say that the Son of God appeared to downplay the works of the devil. It does not say that the Son of God appeared to decrease the works of the devil. It says He appeared to DESTROY the works of the devil. So I started pinpointing some areas around my life and the lives of my family members and loved ones where the enemy is rearing up his ugly head. And with great joy and a sense of victory in my chest, I thanked Jesus for coming to destroy his works and asked Him to demonstrate that destruction right before our eyes in those areas. We know that “the ancient serpent, who is the devil” will not be completely bound until the Kingdom of the living Christ comes in its fullness and His throne is established right here on earth. At that time, the prayer we’ve prayed more than any other will finally be fulfilled: Your Kingdom come, Your will be done on earth as it is in heaven. Let’s not let him off the hook. Let’s remind our enemy every single day that he is not only defeated. His works are destroyed in Jesus’ great Name. 2013 Siesta Scripture Memory Team: Verse 22! Hey, Sweet Things! I’m writing you from the same pajamas I put on this morning after a bath. The flu hit the Moores and Jones with a fury at the first of the week and, at this point, Keith, Melissa, Annabeth, and I all have it. Our little four year old ran 103 degrees today. It broke our hearts. She’s been to the doctor and, needless to say, Amanda is not getting an inch from her. You will not waste a prayer on all of us and I’m going to stop and pray right now for those of you who are ailing or have sick families. Gracious Father, touch us with Your outstretched hand, heal and restore us. Take authority over our bodies and our households and command all sickness to depart in Jesus’ Name. Forbid any further spread of viruses, Lord, and speak wellness and strength over us. Show tender mercies particularly to our young and our elderly. Grant us the wisdom to acknowledge Your goodness and faithfulness to us and to give You all glory for the full restoration of our health. Apply the power of the Cross to all that concerns us. 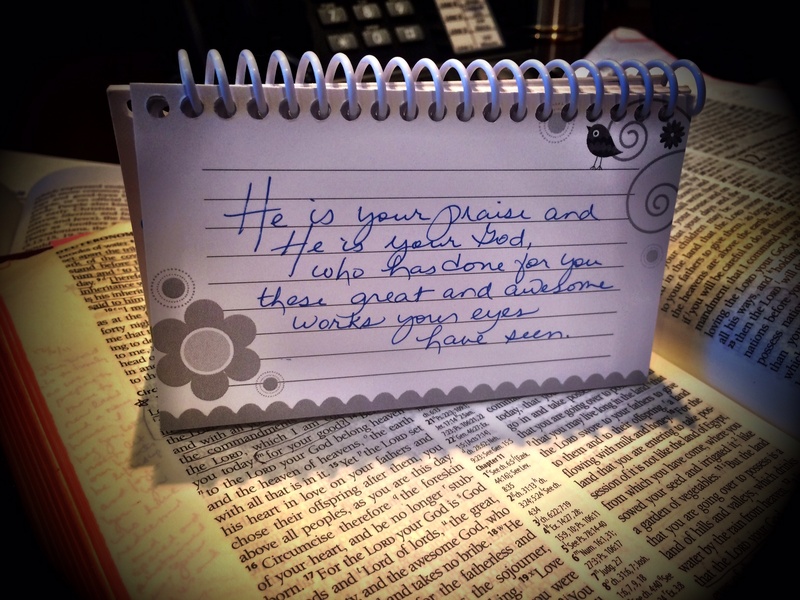 You are worthy of all praise. By Christ’s stripes we are healed. You are faithful and true and we adore You, Lord. In Jesus’ Name, Amen. I’m going to go ahead and post this an evening early in hopes of sleeping in a bit in the morning. I’m planning to be back at work with full strength on Monday, God willing and grace-bearing. I love you and it is such an honor to serve you. OK, Sisters! Let’s hear your verses! Only 3 more to go! 2013 Siesta Scripture Memory Team: Verse 21! Girls, WE ARE ALMOST THERE!!! In fact, if you set your sights on our celebration in January and you’ve memorized all your verses so far, you have everything you need to qualify. HOWEVER, don’t quit now! If you can memorize 20 verses, you can memorize 24! I think Lindsee told you in the previous post that I did a video blog for you guys on Tuesday as soon as I came into work after my LPL trip and that thing took until Wednesday night to download. I had missed y’all so much and was so in the mood to spend time with you in the Scriptures. At that point, however, we felt like it should wait until Monday since we had our SSMT post coming up right away. 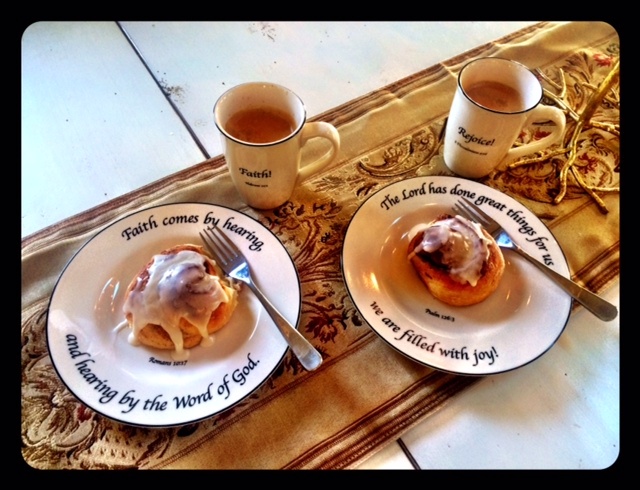 In between, we were ecstatic to extend to you a guest post from a dear sister in the faith, Crista Merrell, who leads women at Bayou City Fellowship where Lindsee and I serve. I hope it blessed you. I will love Crista forever because she is one of the best friends my daughter Amanda has in the entire world. Pastors’ wives desperately need girlfriends that are trustworthy. And girlfriends that are fun. Crista is both. Crista is also a mighty woman of God. A warrior. She is a servant to the bone and has one of the neatest, most colorful families I’ve ever had the privilege to know. Jesus is gorgeous on them. OK! On to our task! 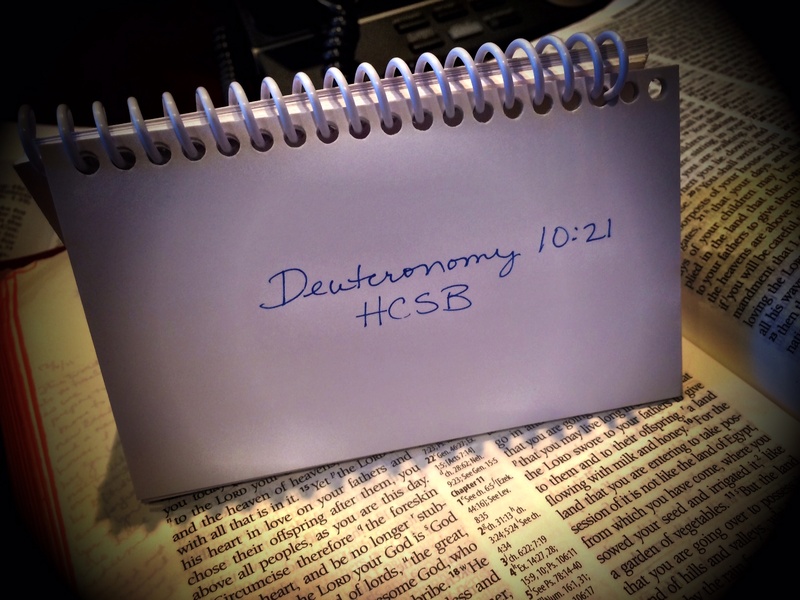 I’ve not memorized out of the HCSB before but it’s the version LifeWay (my Bible study publisher) asks its authors to use in our curriculum so I spend a great deal of time in it when I’m writing a study. I really love it. I just got in the habit of memorizing out of the ESV or NET. I came upon this verse today as I was cross referencing something for Children of the Day and I adored the translation. I’ll let the pictures do the talking. You better believe He is. In case my scribbling is too hard to read, it’s Deuteronomy 10:21 HCSB. Ok, Sisters, I’m ready to hear yours! I love you so much. If you can carve out about 23 minutes toward the first of next week, we’ll get into the Scriptures together in the Monday post. 2013 Siesta Scripture Memory Team: Verse 20! My Dear Sisters, just as I was writing this post to you, a family urgency arose and I’m not going to be able to finish it. I’ve erased it and, in its place, put the segment of Scripture that I shared today in staff time before I got news of a serious family need. By faith, I choose to believe that this was what our gracious God wanted you to have today. It is a beautiful segment from Isaiah 41 that spoke very richly to us in staff and I pray will minister to you. (Vv.8-16) In it God is addressing Israel but, as you will see, many of the truths He speaks over them in this chapter concerning His heart toward them and His promise to help are echoed in the New Testament to believers under Christ’s new covenant. If you have a more formal translation like the ESV, consider reading it first then below you’ll find the portion in Eugene Peterson’s translation, The Message. Its vivid language jumped out at me and really tended to my soul. My staff and I printed it out and circled parts of it that the Holy Spirit brought to life in our own hearts and minds and amid our own circumstances. We also wrote notes in the margins and reminders of other coinciding verses and then, in our closing prayer, we let the passages guide our intercessions. You might consider doing the same thing. The two simple words “don’t panic” leapt off the page at me. So did this: “I, God, want to reassure you.” Thank You, thank You, Lord. Here it is and you’ll find my SSMT entry at the end of the post. 8–10 “But you, Israel, are my servant. descendants of my good friend Abraham. Telling you, ‘You’re my servant, serving on my side. nothing to show for their lives. 14–16 “Do you feel like a lowly worm, Jacob? Feel like a fragile insect, Israel? I, GOD, want to reassure you. The God who buys you back, The Holy of Israel. turn those tough old hills into loamy soil. to the blasts of sun and wind and rain. expansive in The Holy of Israel! Peterson, E. H. (2005). The Message: the Bible in contemporary language (Is 41:8–16). Colorado Springs, CO: NavPress. I love you guys so much. Let’s press on with eyes of faith, Sisters. He who calls us is faithful! 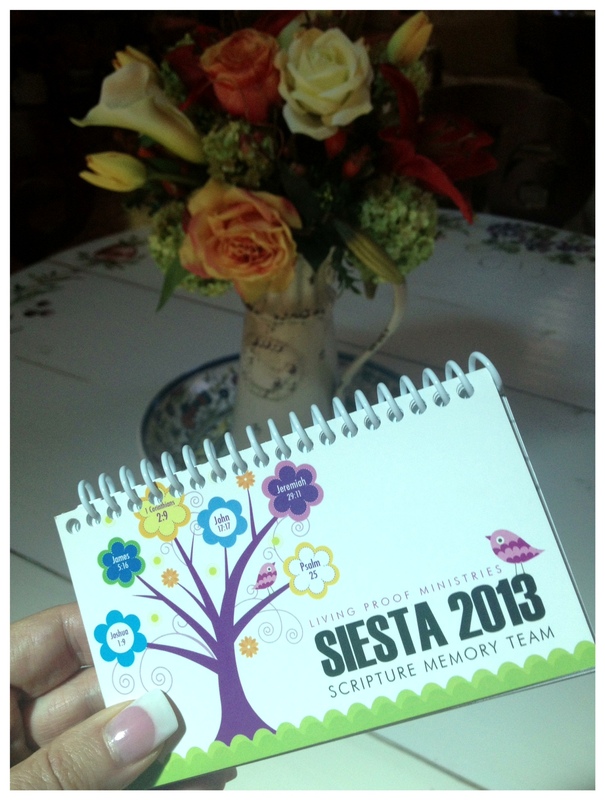 Siesta Scripture Memory Team 2014 Celebration Registration is here! *Update: A few of you are having issues registering because you can’t enter your information into the blank spaces. If you’re having problems, slide your arrow over a little bit to the right of the word and click until your cursor pops up. That should take care of the issue as it might be a little confusing with no boxes. I hope that helps! Also, if you have any questions about SSMT, you can email our event coordinator Jenn Hamm (jhamm@lproof.org) and she will be happy to help you. However, before you email her, make sure your question is not already answered on the FAQ page to save her a bit of time. Grin. Ladies! Can you say wordiest title ever? But it’s finally time to register for our SSMT celebration! We’ve been getting a ton of questions revolving around the celebration, and rightfully so. Y’all are excited, and so are we! To officially register for the event, click HERE! Also, for those of you who want to get all your ducks in a row as far as travel, lodging, what airport to fly into, contact information, requirements for coming and so on, you will also find the FAQ page in that link. We are so excited, y’all and cannot wait to celebrate this victory with you! 2013 Siesta Scripture Memory Team: Verse 19! Though I won’t publish this post until Tuesday, the first day of October, I am writing to you on Sunday. I have the house all to myself today – not even a dog in sight – and I am sitting on my back porch as a generous rain soaks the ground, polishing the wide leaves of sweet gums on its way down. Our trees this far south are still plump and green and, right this minute, I don’t mind because the leaves have such a sheen on them in the rain that they look like vinyl. The temperatures will drop one slow degree at a time over the next month but we usually don’t have what people call “Autumn” here until as late as November. And it’s almost unrecognizable even then. Suddenly you just look up and the trees don’t have leaves and it hits you that you probably missed Fall on your way to work that morning when you ran into Starbucks for a dry cappuccino. An Arkansas girl by heritage, I am on the hunt for Red October by mid September but I can’t think of a time since I’ve lived on the Gulf Coast that I’ve ever found it. Well, except when I close my eyes and look. And it is beautiful there. I do love Houston though, despite how season-challenged it is. Good people. Many, many who earnestly love Jesus and crave the sense of His presence and serve Him with both life and heart. Its diversity kicks up a rich climate for faith and a prime place to meet people very different from you who seek Jesus feverishly. It’s not as easy to keep your stereotypes tidy here. In the early years of speaking, God purposed that I’d accrue copious hours of experience serving at various churches, women’s breakfasts and luncheons right here in our city limits and still get home to greet my children after their school day. I often pulled out of the driveway when they hopped on the school bus and squealed my tires back on the concrete just minutes before they pulled up at 3:15. My kids loved riding the school bus and, as it turns out (I write this with a smile), it was a grace to me. On paper, our lives shouldn’t have worked but somehow it worked (apply the term loosely) in practice. That’s the beautiful oddity of the will of God. What should easily work doesn’t work when He’s not in it and what should never work does work when He is. It’s crazy to think about in retrospect. He has been so faithful, just as He will be to you as you try to balance it all and seek His mercy through the insanity. I wish I could somehow add the soundtrack of what I’m presently hearing to this post. I wish you could listen to the comfort of the rainfall, especially if you are feeling chaotic or anxious right now or frantic about how something’s going to work out. The water is falling steadily, not a soft shower or a downpour. Constant and consoling, almost like one of those sleep-settings on your iPad. And I wish you could hear 4 male hummingbirds competing over the feeder that is hanging about 8 feet from where I’m sitting. It mesmerizes me to watch them and I think you might like it, too, once you adjusted to the pace out here in these woods. Sometimes we really do just need everything and everybody else to shut up for a minute and let us listen to the sound of God being God around us. These moments are brief for all of us. Just five days ago I was fit to be tied over something. I do mean fit to be tied and, over the weekend, greatly concerned about a situation even while I served. But I am going to sit here for the next few minutes and pour myself a cup of coffee while God pours these woods a cup of rain. Well, I guess you can tell that I’m in a musing mood so perhaps I should wrap this post up before I work my way over to subjects like world peace and dark nights of the soul and existential crises and the beauty of aging and the delights of youth. Honestly, I can feel a poem trying to write itself in my head. This post must end with perfect timing before, indeed, my words start rhyming. Run for your life. It’s almost too late. Here’s my Scripture for this October 1st! Amen, You do, gracious, merciful God. I love you, Sisters. You are a joy to me. The next post will be registration for our SSMT celebration so we can get an idea how many to prepare for. Wooohoooo! It’s almost time to kick up our heels! 2013 Siesta Scripture Memory Team: Verse 18! If you happened to join us for the simulcast Saturday (we enjoyed worshiping and studying Scripture with you so much! ), I bet you could guess my verse without ever seeing it. Here goes! It’s 11:15PM Saturday night and my eyes and fingers are so tired, I can hardly type. With your gracious permission, I’ll make this one short and sweet this time. I do so dearly love you. I’ll need a little grace on Sunday for moderation. I truly have to get some rest or I’ll never make it the rest of the week. Go ahead and leave your verses but keep in mind that they might not get moderated and posted till Monday after Living Proof opens. I love you guys! Hold fast to Jesus! 2013 Siesta Scripture Memory Team: Verse 17! I cannot believe my eyes! Verse 17! And you, my dear sisters, have outdone yourselves. You are still numbering 2000+ this far into the year so it looks like our hard-working team is going to finish 2013 STRONG. I pray that even today you would feel a great rush of God’s sublime pleasure over you. You’ll notice by the date on this post that I published it late Saturday night. Our handsome nephew is spending the night with us and he’s sleeping in the area of our house where we get the best internet connection. I thought maybe he might be a bit more blessed if I did not wake him up first thing Sunday morning and need in his room with my laptop. My selection this time around comes from my morning devotional yesterday. I have loved this verse for so long and, this many years from the first time I saw it, the tears still burned in my eyes over the beauty of it. Few things strike awe in our wondering, wandering hearts like waking up all the sudden to a fresh revelation that God is right there in that place. And has been all along. I love to look up a verse in a number of different translations. 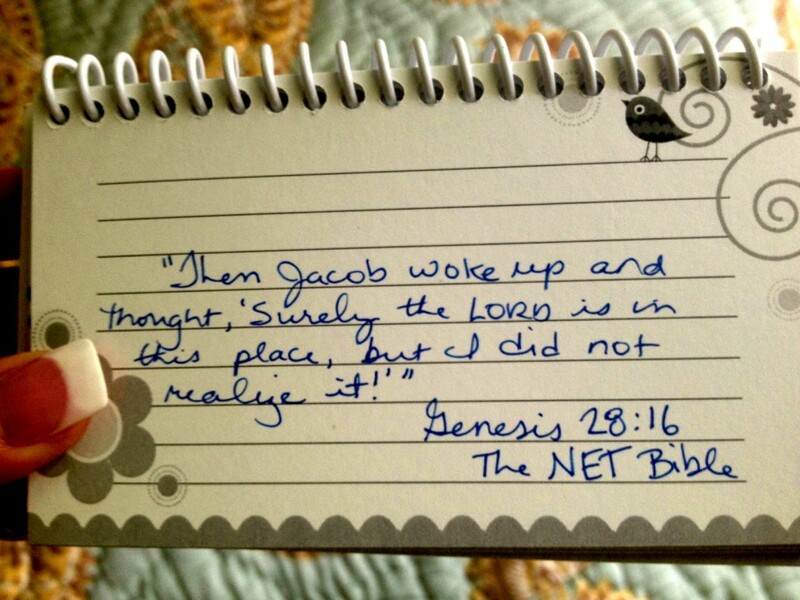 I was touched by each one I found for Genesis 28:16 and I’m memorizing it out of the NET. 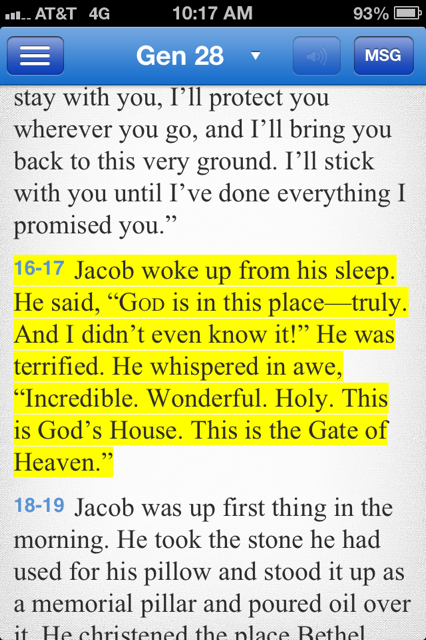 But I was completely captivated by how The Message worded what Jacob whispered. Isn’t it beautiful? God, we love You. We long for You. We want to see you revealed and perhaps most of all in the places we least expect to find You. Awaken us to Your Presence. Hear the song of our souls even when our lives betray it. OK, Sisters, I’ve shared my verse with you. 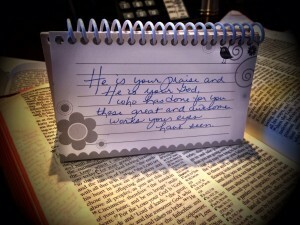 Now you share your verses with me! 2013 Siesta Scripture Memory Team: Verse 16! Before I fool anyone, each of you should know that this is Lindsee posing as Beth for this particular SSMT post. She and her girls on a little girl’s getaway that is much deserved. So when she mentioned that she might not be able to work this post out, I told her not to even think of it and enjoy her time away! Side note: She was telling me yesterday she’s not sure when her last actual vacation was because our siesta mama has spent the last two scheduled vacations either being Bibby for a week (her grandma name), or writing for a week! So! Needless to say, this girl’s getaway is earned and joyfully welcomed! We blessed them as they walked out the doors yesterday and promised them they didn’t need to worry about one detail here. She also assured me she’d hopefully have some fun pictures for you guys when she gets back! SSMT is a big detail. So here I am. I realize that was a much more detailed description as to why I’m taking over SSMT this time than you probably cared to know, but now it’s in official wording and I’m leaving it. Beth gave me the option to share my verse with you guys along with the one she’s memorizing this go around, so I decided to take her up on that. The more the merrier, right? My verse is actually probably very familiar to y’all, but it hit me fresh a couple of weeks ago and knew it needed to be put into my memory for good. It’s one of those verses I know, and I could quote it, but not verbatim and I really wanted to be intentional with it this go around, especially since I really mixed up the version I’m memorizing it in this time which really makes it pop in my mind. This I know to be so true, I need Jesus. And I need Him to steady my heart, because He alone can do that. Want to hear some synonyms of steadfast? Steady, firm, stable, constant, staunch, and immovable. Each of these descriptions are things I want to be said and true of me. I think it’s so fitting that persevering and steadfast follow each other because it’s in my persevering that He makes my spirit steadfast, but I tend to get really distracted and unsteady pretty quick. Which I guess is why we’re told to persevere in the first place. Maybe it’s just me, but so many times I allow my circumstances to determine my steadfastness. When things are going good (translation: the way I want them too), persevering comes easy, as well as a firm and steady devotion to the Lord, but it’s when the going gets tough, that the tough get going. That’s when it’s time to wrestle that hard thing out with Him. For me, an example that comes to mind is singleness. Some days I love the freedom it brings, while other days I’m wrestling my way through this season. Very quickly I can go from steadfast to discouraged. Steadfast to lazy. Steadfast to frustrated. I want so badly to be faithful in each season of my life, and to truly live in an “undivided devotion” to the Lord that Paul talks about, but we can all admit it’s not always easy. If it were easy, the vast majority would be doing just that. I don’t always want to do the work it takes to have a clean heart, and a persevering Spirit, but I know all too well that when I’m not yearning for it is the perfect time to ask for it. So I’m asking for a clean heart! That God would renew me from top to bottom. You’re more than welcome to join me this go around. Amen. He sees everything. He knows everything. He created everything. If you stop and take that verse a part line by line and dwell on that, it’s really mind blowing. I have no doubt our Siesta Mama would have more to say about that, but I’m just going to leave you with wow. So, if that scripture stirs something up in you, tag on with her. Well, ladies! Time to persevere to the end! We’re so close. If you got through summer, you can certainly make it through the fall. Oh, and because I’ve been getting some emails and phone calls, I’ll go ahead and let you know that we’re planning on having all things SSMT celebration and details up SOON. Like, hopefully as in the next SSMT post or two. We’re so pumped and we love y’all dearly. 2013 Siesta Scripture Memory Team: Verse 15! Soon after this post is published, I’ll be on a plane to Sioux Falls, South Dakota for this weekend’s Living Proof Live. I love going to the Dakotas so I am filled with joy over the privilege to serve there and anticipating God’s gracious and obvious (please let it be, Lord) presence crowded around us and welling up within us. Please pray for Jesus to be exalted, experienced, and enthroned there and for many to be saved and stunningly delivered. 17:6 They will be like a shrub in the desert. in a salt land where no one can live. who put their confidence in me. whose roots spread out toward the water. It has nothing to fear when the heat comes. It has no need to be concerned in a year of drought. It does not stop bearing fruit. If you are like me, you found the way the NET translates the very first verse (V.5) a little disturbing. You’ll be relieved to know this isn’t the Scripture I’ve chosen to memorize (smiling) but it still needs addressing so that we’re not too distracted by it to engross ourselves in the remainder of the segment. If you’re familiar with the passage, you are probably more accustomed to wording like the NIV: “Cursed is the one who trusts in man.” The fact that the NET makes God the one “putting” the curse on man makes us squirm. Before we let it tie us in a knot and throw us in a lake of fear, we have to remind ourselves of our position in Christ. We have the glorious benefit of living this side of the completed work of the Cross and resurrection. Jeremiah 17:5 is still tremendously relevant to us because it unfolds the misery of counting on mere flesh and blood. I wonder if the “curse” talked about in this verse is of the same ilk as the one in Genesis 3 that came directly from God to man after the fall in the Garden. If Adam and Eve were doing anything at all when they ate from that tree, they were shifting their trust from God to themselves – mere flesh and blood – by attempting to be God-like. Though the Cross of Christ bore the curse for us, we can still endure the desolation that invariably results from placing our trust and confidence in people rather than God. This gets us where we’re going in our post today. Look back at Jeremiah 17:6 because this is the part that totally captivated me. Read it again if you need to but don’t proceed until you’ve tried to absorb that second sentence. Have you ever been right in the middle of something good happening and yet missed the full experience and joyful impact of it? Surely you’ve said silently to yourself as I’ve said to myself, “I should really be happy right now. What is wrong with me? ?” You know the feeling. You’re in a celebration or service of some kind or a holiday gathering and yet you almost feel detached from it. You’re there. But you are somehow disconnected from experiencing it. You know “it” (the positive thing presently happening) but you can’t feel it. It’s a good thing but you don’t feel good about it…or in it. What on earth is that about? Jeremiah would suggest that the experience of good can be disconnected from the good because we are in a season of shifted trust from God to man. When we’ve set our hopes for happiness in how well all our people are doing…getting along…flourishing…affirming us…satisfying us…and all-around-generally-blessing us, and we even get a glimmer of it, we can’t experience the good because we know down deep that we can’t hold onto it. As much as we love all our people, we know that, ultimately, they are not going to come through for us. One shoe will drop. Then the other. The disappointment will come. And the harmony we feel for this moment with our fellow humans could at any second flip upside down into complete mayhem. Notice the part that says “they will be like a shrub in the desert.” Isn’t it ironic that the more we depend on flesh and blood to come through for us and to fulfill us, the more isolated we become? You’d think that numbers alone would insure company and community. In other words, why derive our strengths and confidences from one God when we could get infinitely more out of all these people? Out of all these communities? Out of all our fellow church members? Out of all our Facebook friends? Our fellow tweeters? Company is one click away. Trust in man can seem a great place to visit but no one can really live there and come out calling it living. It’s so odd to me that the more drawn I feel to God and the more taken I become with His Presence, the freer I am to love other people and the less I hold them responsible for me. Community with God increases our “experience” of good in a community of people. It is its own paradox. When we place our confidence in mere flesh and blood, we are shortchanged even when good things happen. When we place our confidence in God, the Immortal Invisible, we have nothing to fear even when hard things happen. The former leaves us a dry shrub. The latter makes us a fruit-bearing tree. My blessing is on those people who trust in Me, who put their confidence in Me. Let’s hear your verses, Sisters!